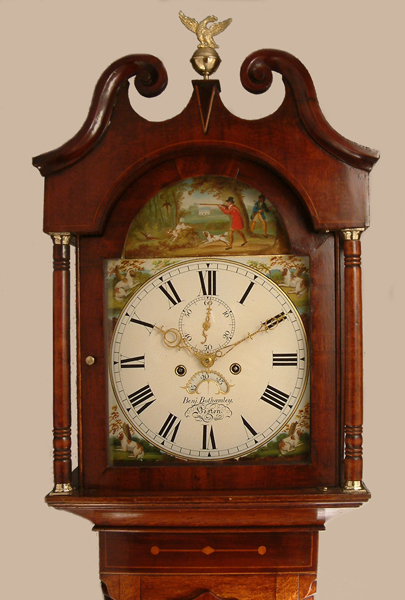 Benjamin Bothamley of Boston Longcase Oak Circa 1840 - Height 83in. This Longcase Oak Archive's Maker - Benj. ( Benjamin ) Bothamley of Boston ( Lincs. ) recorded 1828 - 50. Typical eagle/ball centred swan neck pediment "Lincolnshire" case of quarter sawn oak showing "golden feather" medullary rays with "ball and string" inlays under throat moulding, to trunk canted corners, and with good mahogany crossbanding and details.Mahogany inlaid "diamond" to centre of shaped top trunk door also featuring a small ivory key escutcheon. All set on shallow bracket feet. 12" breakarch painted dial with extremely well executed, bold and colourful pheasant shooting scene to arch, each spandrel featuring brown/white spaniels.Punch decorated brass hands, subsidiary seconds dial and "sad mouth" date aperture. 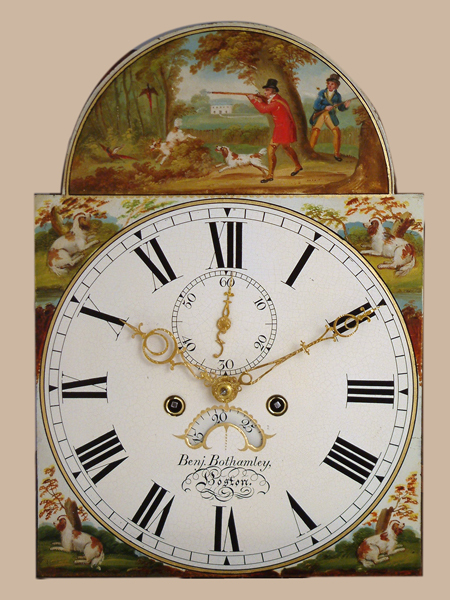 The dial by Baker ( 5 such recorded ) - any four of which were active circa 1840 when the dial was made. Good quality, 4 knopped pillar 8 day movement with hourly ( rack ) striking on a single bell. Benj. ( Benjamin ) Bothamley of Boston ( Lincs. ) recorded 1828 - 50. 83" ( 211 cms. ) or 80.5" ( 204.5 cms. ) ex finial.